The present study reports an eco-friendly phyto-synthesis of silver nanoparticles (AgNPs) using aqueous flower extract of Cassia angustifolia. Preliminarily, the synthesis of AgNPs from flower extract was visually confirmed by color change. Further formation, shape, size, and stability of the synthesized AgNPs were characterized by UV-visible spectroscopy, SEM, EDX, XRD, FT-IR, DLS, and zeta potential analyses. SEM images showed that the synthesized AgNPs were spherical in shape with an average size of 10–80 nm. Phyto-chemical analysis and FT-IR studies confirmed the role of phyto-compounds in the flower extract for the capping, formation, reduction, and stabilization of AgNPs. The antioxidant ability of AgNPs and plant extract was evaluated by DPPH, H2O2, and FRAP assays. The percentage of antioxidant activity was increased with increasing concentration of AgNPs. In addition, cytotoxic activity of the AgNPs was evaluated in human breast cancer cells (MCF 7). Phyto-synthesized AgNPs showed dose-depended manner (IC50 − 73.82 ± 0.50 μg/mL) of cytotoxic activity against MCF 7 cancer cells. The online version of this article ( https://doi.org/10.1007/s12668-018-0577-5) contains supplementary material, which is available to authorized users. The authors would like to thank Department of Science and Technology (DST-FIST), and College management for providing laboratory facilities and also we acknowledge the Dept. of Nanoscience and Technology, Karunya University, Coimbatore for extending their material characterization facilities. Bethu, M. S., Netala, V. R., Domdi, L., Tartte, V., & Janapala, V. R. (2018). 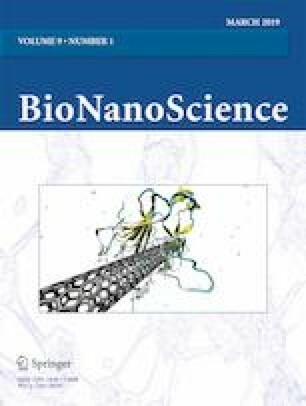 Potential anticancer activity of biogenic silver nanoparticles using leaf extract of Rhynchosia suaveolens: An insight into the mechanism. Artificial cells, Nanomedicine, and Biotechnology, 1–11. https://doi.org/10.1080/21691401.2017.1414824. Prabu, K., Rajasekaran, A., Bharathi, D., & Ramalakshmi, S. (2018). Anti-oxidant activity, phytochemical screening and HPLC profile of rare endemic Cordia diffusa. Journal of King Saud University-Science. https://doi.org/10.1016/j.jksus.2018.04.025. Netala, V. R., Bukke, S., Domdi, L., Soneya, S. G., Reddy, S., Bethu, M. S., & Tartte, V. (2018). Biogenesis of silver nanoparticles using leaf extract of Indigofera hirsuta L. and their potential biomedical applications (3-in-1 system). Artificial cells, Nanomedicine and Biotechnology, 1–11. https://doi.org/10.1080/21691401.2018.1446967. Khan, S. U., Anjum, S. I., Ansari, M. J., Khan, M. H. U., Kamal, S., Rahman, K., & Khan, D. (2018). Antimicrobial potentials of medicinal plant’s extract and their derived silver nanoparticles: A focus on honey bee pathogen. Saudi Journal of Biological Sciences. https://doi.org/10.1016/j.sjbs.2018.02.010.